Wedding debt is such a problem that organizations have produced guides to avoiding bad credit and overspending. The Chicago Tribune ran a feature on couples who spent even above the average $30K most spend. So you can’t blame any couples looking to save. Cash Bars: It’s maybe one of celebrity David Tutera’s pet peeves. Cash bars, he insists, are unfair to guests. You can still cut costs by selecting a more limited bar, or serving drinks with dinner. Invitations: In a digital age, it’s tempting to set up a Facebook page and call it a day. 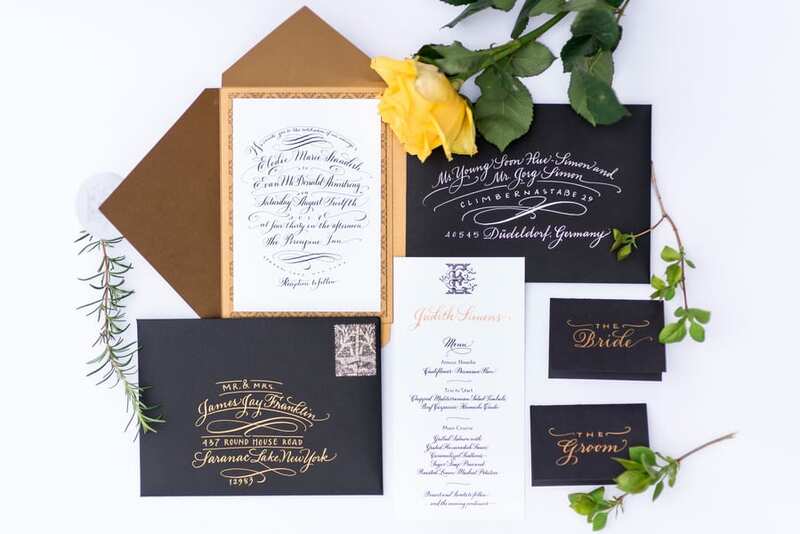 Invitations, after all, not only take time, but can cost hundreds of dollars you might not have. Brides Magazine suggests using e-vites for managing RSVPs for small groups, but you should still plan on mailing traditional ones. To save, shop your local hobby store and personalize. You could even make your own, for a fraction of the cost. Day-of-Coordinator: Notice we didn’t say planner. While a wedding planner is very helpful if you can pay for one, a day-of-coordinator is that much more important. Not convinced? Check out all the things a day-of-coordinator does to make sure your day runs smoothly. Silverware: Plastic? Don’t even think about it. While it’s perfectly acceptable for an outdoor picnic, it takes away from the special nature of a wedding. For an unique way to save but still stay classy, shop antique and thrift stores, great for a shabby-chic theme. The Meal: Who says you need a full meal to have a great wedding? Host a brunch, a dessert, or an hors-d’oeuvres reception. Far from tacky, it can actually be quite elegant. The Dress: No, don’t go to your local thrift shop. And ordering online is also discouraged. Do shop trunk shows, sample sales, and ask for discounts. There’s no reason to spend a fortune on a gown. Music: This is actually controversial amongst experts, with some insisting you need a a DJ or a live band for a good wedding. If you have the creativity, energy, and a helper, you can hook up your own music system. Just be sure to check out what you need to do to make it successful, rather than a stressor. Otherwise, or without a quality sound system, this would be in the spend category.